McNary wrestler Noah Grunberg defeated Kaleb Fegles-Jones of West Salem by a 13-2 major decision. 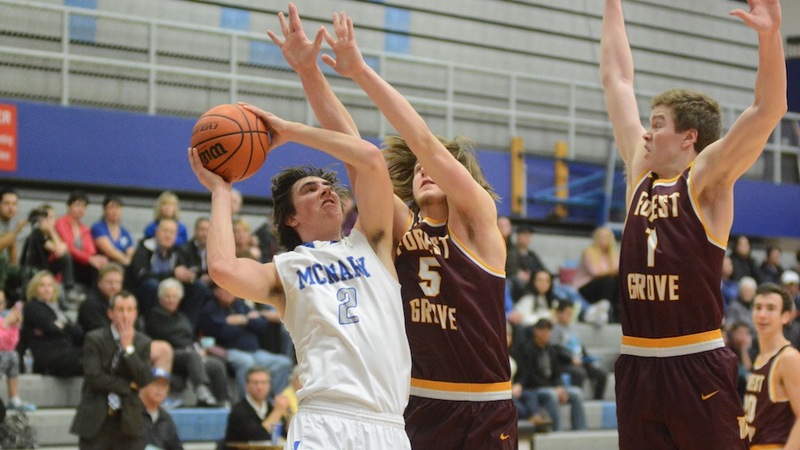 SALEM—McNary had a two-point lead through nine matches at West Salem. But the Titans won the final five, including three by pin fall, to defeat the Celtics 51-26 on Thursday, Jan. 5 in their first Greater Valley Conference dual of the season. After Noah Gatchet won by forfeit at 106 pounds to give the Celtics a 6-0 lead, West Salem won three matches in a row, all by pin fall, to go ahead 18-6. At 132 pounds, Sean Burrows was able to end the streak by pinning Mason Meredith in the second period. After the Titans picked up another pin to expand their advantage back to 12, McNary won three straight to take a 26-24 lead. At 145 pounds, Noah Grunberg won a 13-2 major decision. Wyatt Kesler then pinned Luke Liedkie in the first period at 152 pounds and Brayden Ebbs won a 14-0 major decision at 160 pounds. Isaiah Putnam looked to continue the winning streak at 170 pounds. But leading 9-7 in the third period, he was slammed to the ground and pinned by Seth De Leon. Ebbs was proud of the guys who hadn’t been here before, like freshman Tyshawn Sang, who given the option of wrestling defending conference champion Brenton Reddy at 182 pounds or jumping up to 195, chose to take on the champ. Due to injuries, the latest being senior Carlos Vincent, McNary had six freshmen or first-time wrestlers in it’s lineup at West Salem. “Rather than talk about what we could do or should do, I’m going to go home and be proud of my young kids,” Ebbs said. “They got experience they don’t normally get. Our juniors and seniors should be in the lineup and we’re putting freshmen in. If they stick with it and do the things we teach, it will pay off in a year or two. The Celtics will return to West Salem on Feb. 17-18 for the district meet. The lessons in checking my privilege begin before I arrive at the Community Action Agency (CAA)Warming Center in North Salem. I left the house early intent on picking up a more-sugar-than-coffee coffee from my favorite spot downtown, a few blocks from where I will spend the next four hours checking in some of the area’s homeless residents for the night. As I drive, I think back to my day off, which I spent digging into a video game I got for Christmas and watching beautiful, and unexpected, snow blanket my backyard. In retrospect, it seemed like a day spent gaming was a way to avoid thinking about what such cold temperatures meant for those living on the street. I’d signed up for a shift at the temporary Warming Center, located at the old Oregon Department of Energy (ODE) office on Marion Street Northeast, the day after the call for volunteers went out. Temperatures were expected to be in the high teens at the time the activation was planned, but it had warmed a few degrees since the initial decision to open the center. The coldest temperatures were now expected in a few days and CAA organizers are planning to extend the number of days the warming center will be open to accommodate the new forecast. By the time I cross the Salem-Keizer border, I’ve given up on the pursuit of coffee. I left early because I didn’t want to show up at the Warming Center with a better cup o’ joe than what we’ll be serving to warming center visitors – decaf coffee and hot water for tea, cocoa and bouillon. The more I think about how I spent the hours leading up to my shift, froufrou coffee takes on an air of unnecessary opulence. It means I arrive at the warming center half an hour early, but I check-in anyway in hope of being able to assist in set-up for the evening. There is already a small line of homeless people waiting outside. Organizers have already laid out sleeping pads, about an inch-and-a-half thick, on the floor. There’s approximately 80 of them and I’m told by CAA Deputy Director Cyndi Astley they are expecting to fill up this evening. I’m given a tour of the facility which is mostly open space and a few rooms off the main floor where supplies, donated items and the bags of visitors are kept. There’s also a common area where visitors can eat, drink and keep company. There will be a full orientation at 7:30 p.m. with the other people on my shift, but I get enough to know the lay of the land and then help unpack some of the evening’s supplies. Shortly before we start checking people in, a member of the community pulls up in a truck with food and five still-in-the-box, cold-weather sleeping bags. Organizers accept the sleeping bags, but decline the food. The ODE Warming Center hours have been set up so that homeless individuals can get a meal at Union Gospel Mission and then walk over to one of two warming centers, the other is located at an old car dealership a few blocks away. As the doors open, I am posted at the bag check-in station. Visitors to the center are only supposed to have a small, transparent bag of personal belongings at their sleeping space. Everything else – including sleeping bags, blankets and pillows – gets put in drawstring trash bags and labeled with a name and number for pick-up when the warming center closes in the morning. I’m told by a volunteer who worked the night before that we should ask if they were here the previous night because they may have a bag with a blanket already stored at the site. If not, they get a new one. The wool blankets we dole out work fine indoors, but fare poorly in the elements. I work my way through the first couple of visitors and feel as though I need to be more welcoming. I start trying to initiate something more like a conversation and immediately shove my foot halfway down my throat. I ask one visitor as he puts his backpack in a trash bag if he has everything he needs for the night. “Not a dang thing,” he responds with disbelief at my out-of-touch question. I try again with the next visitor as I collect his belongings, “How are you doing?” He was checking into a warming shelter, and if I’d given it a second’s thought I would have nixed that question, too. By the fourth or fifth try, I finally settle on, “How are you holding up tonight?” Some visitors barely respond while others engage me in small talk. A couple thank me for taking the time to volunteer, which makes me feel like a fraud. To my mind, four hours is such a small sacrifice to make in the face of a mounting problem throughout the area. All the while, I’m having to enforce the rules about what is allowed in the sleeping area. Small transparent bags, nothing else but the clothes on your back. Make sure you have your cell phones, cigarettes, and medication if you need them close. I’ve become the TSA agent of the down-and-out. Regardless of how it makes me feel to be an enforcer, the rules are in place for a reason. Keeping personal belongings in a secure area means no one will be tempted to rummage through another person’s stuff, which reduces conflict and the need to push anyone back out onto the street on a frigid night. Somewhere around this time, I remember what Cyndi told us right before we opened the doors, “We’re here tonight so someone isn’t freezing to death on the street.” Within that context, asking someone to surrender all their worldly possessions in return for a night of shelter is enough of a prod that I keep going. About an hour into my shift, intake slows to a trickle. Until the lights shut off at 10 p.m., I spend the time visiting with fellow volunteers and some of the night’s visitors. Several of the volunteers are looking for ways they can get involved during the rest of the week, either through donations or additional shifts, while visitors seem more keen on just finding a friendly ear. Mostly, however, they keep to themselves. Not long after the lights dim, I realize that the primary myth of the warming center is that it’s not what anyone with regular access to a central heating system would consider warm. The front door has been held open by the line of visitors for the better part of the night and the temperature seems to drop several degrees as people stop moving around and settle in. It’s a good bit warmer than the outside temperature of 33 degrees, but its closer to the times when my family has awoken to something having gone wrong with our furnace and the temperature inside is somewhere between 55 and 63 degrees. On top of that, most of our visitors have only a thin sleeping pad and a blanket to ward off the chill. They’re also trying to sleep in a cavernous room where any warm air is rising well above them. Those days my family has endured without indoor heating were spent with blankets piled atop us at night, and sometimes it didn’t feel like enough. By the time my shift ends at 11:30 p.m., I’ve put my jacket back on and I’m fighting the urge to put up the hood on my sweatshirt. I bathe in warm air from my car’s heater the second it warms up to an acceptable temperature and then take a steaming shower to finish the job before falling into bed. The temptation with stories like these is always to wrap them up with a tidy bow. A signifier that things are rough, but there are good people trying to make a difference. That is true, but it’s also true that the need for services like warming shelters isn’t going away. We can’t wish them into oblivion, and someone is always going to be needed to collect personal belongings as our area’s homeless residents check-in at shelters and warming centers. Anyone who can make it through such a task without feeling a twinge of shame at their indulgences is tougher than me. At the same time, local government leaders have been collaborating on a task force for the past year trying to figure out a better approach to tackling the problems of homelessness. The task force stops meeting in February and concrete plans for the way forward are still somewhat sketchy beyond endorsing the work of some nonprofit groups dealing with the issue in their own ways. The worst possible outcome is to end up yet with another plan/study/pamphlet of services that sits on a shelf for the next decade and collects dust while waiting for funding that never materializes. 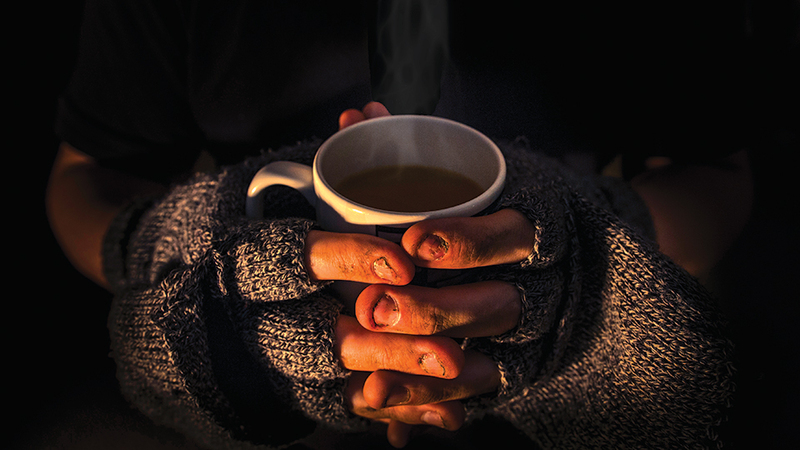 The warming centers may prevent someone from freezing to death on the streets, but it a far cry from restoring anyone’s dignity. It’s incumbent upon all of us to find a better way to do both. As of press time, Wednesday, Jan. 4, volunteers are still needed for the remaining warming center shifts. Visit www.mwvcaa.org to sign up. The warming centers can also use donations of Clorox wipes, large black garbage bags with drawstrings, thick masking tape, powdered creamer, sugar, bouillon, and the following clothing items in adult sizes: warm coats, gloves, knit caps, socks, jeans and sweatshirts. Economic models are being thrown on the slag heap of history as technology changes the way we live and work. Social media has revolutionized communications. Every new discovery and service brings their own rewards and challenges. The way we work has changed and will continue to revolve. The way we move around is changing, as much a result as technology and life changes. Public transportation in our area does not have wide support, most of us still opt for our private vehicles which means many car trips with only one person. Some complain that public buses don’t have a schedule or a route that works in their lives, especially when there is no late evening or weekend service. For those who do retain their driving habit the complaint veers toward traffic in general—too much of it, too slow, other drivers. Traffic continues to be one of the top livability issues of local residents. Add all of that with the fact that younger people are not as hyped to get their drivers license and a car as earlier generations. This gives the city of Keizer a chance to be a leader by allowing ride-hailing services to operate in the city. Salem’s incoming mayor Chuck Bennett wants to see Uber and Lyft start to operate in his city. Let Keizer be the leader on this issue (Mayor Cathy Clark has been a strong voice in all things transportation for years)—let Keizer set the standard for how services such as Uber operate. Allowing ride-hailing services in Keizer (and Salem) would help people get where they need to go when they want to go. Things might be different if votes in the Salem Area Transit district approved bonds and levies to expand and improve bus service in our region. Barring that local municipalities must take steps to help their citizens move around according to contemporary models. Approving ride-hailing services offers the public an alternative to their current choices of transportation. The first step is for the city to find out how Uber and Lyft operate and how they can be profitable here. Cities of every size across the country have had policy discussions regarding these services including issues such as liability, permitting and licensing. Keizer has a little-used licensing ordinance for taxis; there is not much call for taxis now because wait times are unacceptable to some riders, primarily because cabs come from bases in Salem. A former mayor once said that Keizer is open for business. If that is still viable, let us open it for all businesses. Let us tell Uber and Lyft that Keizer is a good market for them. In the current Keizertimes web poll, more than 70 percent of respondents would use a ride-hailing service. That’s a great start. Ride-hailing services in Keizer would be good for students, for people with appointments in or outside of the city boundaries, for those not able to drive and for those who want to attend a social function where alcohol is served. We call for Keizer to take the regional lead on this issue and create the model that other cities can follow. We want to see this move forward with the fewest obstacles as possible. Our city is open for business. The way people move around is changing. Those are two things Keizer can address with one leap forward: let’s hail a ride. Gene McIntyre started his column (An equation for disaster? Dec. 30, 2016) with the wrong premise. Alexander Hamilton and others created the Electoral College so states with low populations wouldn’t be left out of the process. If they hadn’t created the College, a few large states could control all national elections. For that reason alone the Constitution would most likely not have been ratified. As for his totally biased remarks about Trump, who knows? Many of us had serious concerns when an inexperienced neighborhood organizer and party hack was elected. We didn’t disavow our country or the Constitution. The election is over. It was constitutional. Give the president-elect a chance. That is an equation for Democracy. In recent decades, we have become accustomed to the idea of ex-presidents who leave political combat behind. They might occasionally speak out on behalf of their party: Bill Clinton was an effective “explainer in chief” for Obama at the 2012 Democratic National Convention. But with some exceptions (Jimmy Carter on the Middle East comes to mind), they usually avoided trying to influence policy. In their above-the-fray roles, former commanders in chief sometimes improved their standing in the polls. George W. Bush is a prominent example of the less controversy/more affection dynamic. It is already clear that Obama, leaving office at a young 55, intends to pursue something more than the quiet life. He will lay down some preliminary markers on policy next week in a Farewell Address. He has signaled that he wants to energize a new generation of Democrats and help rebuild a party that he will leave in less than optimal shape. Democrats control neither the House nor the Senate and have seen their share of governorships and state legislative seats decimated. He has already lined up to work with Eric Holder, his former attorney general, to help Democrats in gubernatorial and legislative races. Their goal is to fight Republican gerrymanders by influencing the drawing of congressional district boundaries after the 2020 census. A largely offstage but lively debate is already unfolding over Obama’s coming role. In one view, Obama should recede and allow new voices in his party to take the lead. The Democrats’ path back to power, this argument goes, will best be blazed by a younger generation that can declare its independence from the politics of the past—exactly what Obama himself did in 2008. Why do I care about the fate of any sports team? Why do I consider the teams “my” teams?” I have no impact on or personal reward from the outcome of any game my favorites play. For the sake of transparency here, my favorites are the University of Oregon Ducks and Seattle Seahawks. Meanwhile, what’s most silly? I feel temporarily upset when either one loses and get a boost when they win. I have talked to friends about this phenomenon and they’ve not been much help. Some say they’ve just always been a fan of so and so. They’ve attended a college or grew up in a certain city, say, for example, with an NFL team. Their dad liked that team so it’s an emotional inheritance. Whatever the answer, it is always vague and imprecise; in other words, they do not really know why, but just feel something and carry it like a crucible in team colors. But what is it? Where does it come from? What purpose does it serve? I soberly recognize the irrationality of identifying with a team I never played on, such as the Ducks, although I did earn graduate degrees at UO but as an older student, and would have viewed myself mad if I’d traveled to Seattle for a try-out, even forty years ago when I was still a young guy with a flat tummy. According to the anthropologists, there’s a connection. As long ago as the Middle Ages, peasants played a version of soccer while villages competed with each other, kicking a pig’s bladder around for scores. Games took place at carnivals, festivals and gatherings of all kinds with feasting, dancing and physical activity in which, most likely, every able-bodied person participated. These sorts of human interactions took place throughout the world, in primitive and so-called advanced societies, as far back as early man—it got into our DNA, in ways scientific and artistic, and stuck there. I may understand it better now than as a child. However, once I played on teams then it became natural to enthusiastically support the effort. Even kids who never participated in a sport, like most of the girls when I was young, they showed their support by cheering for the boys they knew. We simply grew up with the habit of supporting school teams and it followed us into adulthood and life thereafter even though, nowadays, most of us do not personally know those for whom we root. Hence, an additional dimension to this subject that can further mystify the questioning mind. Sports in the United States have become unattached from the fans who support them to a point where it is challenging to understand why anyone can cheer for a team. Players and owners take fan loyalty for granted and give back only wins and losses with evermore super-fans, mega-fans, fans who yell louder and spend more on tickers and merchandise. Team member indifference perplexes but the craziness goes on while the professional players have contracts and are paid whether they win or lose. They build it and we come. In trying to figure it all out to a definitive answer, logic fails me. I recognized that powerful, illogical human emotions are involved. The widespread phenomenon has most to do with our being human. I don’t appreciate the disgustingly excessive money in sports, amateur and professional (a moral nation would provide food and shelter for its youth in poverty before paying grown men millions to play with a “pigskin”), but that equation has favored the games over my lifetime. I want to say that my New Year’s resolution is to back off of interest in sports teams but know I’ll fail that commitment as there is an instinctive, powerful force at work, something bigger than me, seeking human social belonging and membership.